There's such a thing as orange honeydew? I've only ever seen green ones...the only orange melon I can think of are cantaloupes...but an orange honeydew? Dang. Shows what a sheltered life I've lived for close to 34 years. File this away under "something new every day." And I now feel as knowledgable about fruit as my 20 month old daughter who calls every fruit an "apple." Gets me every time. 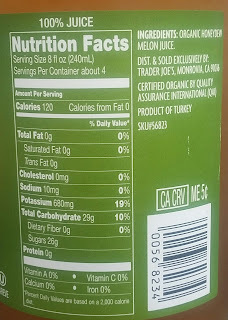 Anyways, there is a TJ's variant of a cold-pressed cantaloupe juice floating around, which I knew this wasn't, but when seeing the label and shade of Trader Joe's Organic 100% Melon Juice, I presumed it was cantaloupe. Which made my first sip very interesting...because, naturally, it tasted pretty much just like honeydew. Perhaps the orange variety are a a slight touch sweeter, because there seemed to be a little extra natural sugar at play here. Also, I'm perfectly comfortable with being further labelled as a fool for saying so, but I also tasted a small amount of subtle astringency here. Maybe that's stemming from the optical illusion that this murky orangey semi-greenish water could kinda kinda look like some type of citrus green tea variant. Eh, whatever. It works. It's a clean, simple healthy juice that tastes like it's straight from the Sledge-O-Matic and refreshes nicely on a hot summer day. I'd still prefer to reach for some tasty lemonade after mowing the lawn, but if this was all we had, there'd be no disappointment. Winner in the wife and kids' eyes too, so not bad at all for just three bucks. This juice is awesome. I bought some Zipzicles to make my own popsicles from Amazon. 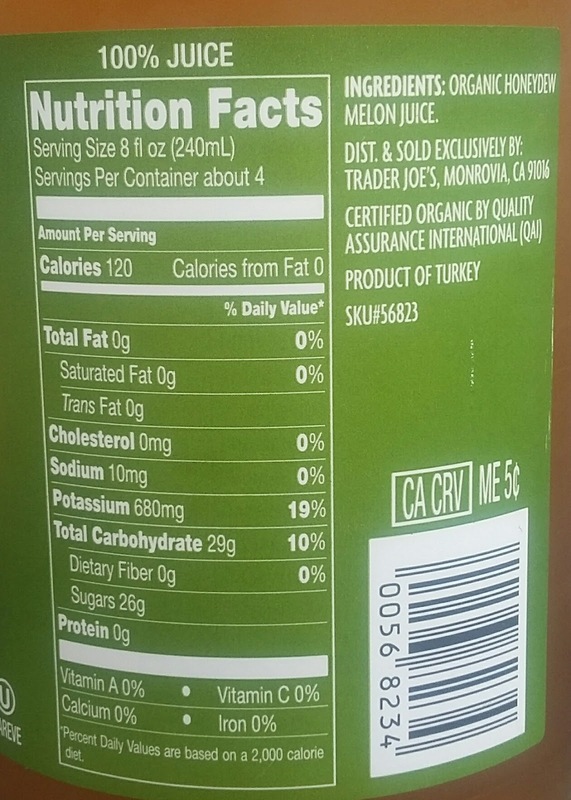 This juice is awesome- hydrating. Makes a lower calorie & lower sugar popsicle. Perfect for summer.